Inelastic demand is a “situation in which a price change leads to a less than proportionate change in quantity demanded” (Hirschey). There are many goods whose inelasticity is considered perfect. Some of these goods could include; gasoline, coffee, cigarettes, and illegal drugs. As we have formed a basis for our inelastic principality, it is important that we start with an example of inelastic demand so that it is easier to understand. If we are paying two dollars per gallon of gas, and the government imposes a 90 cent tax on each gallon consumed what will happen to the prices, and the quantity demanded? 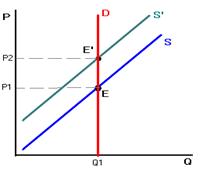 There will be a decrease in supply, which will create a new equilibrium point in the demand and supply function. This will occur as the consumer demand continues to remain the same, as there are no alternative or substitute goods available for gasoline. Visually below, we can see the implications of any price increases in the oil industry are passed directly to the consumer. To see what is causing the price of gasoline to increase we need to look at environmental factors that are affecting these wayward and substantial increases. As supply and demand are two of the biggest components of the cyclical price of oil, there are other factors the influence the price of gasoline. First, the U.S. imports almost 70 percent of its oil supply. This drives up the demand, as the U.S. must compete with other emerging economies, such as India and China. Although these countries consume a fair amount of oil, they are still considerably behind the U.S., as we consume 20.4 million barrels a day, whereas countries such as China “only” consume 6.5 million barrels a day. Second, there are not only environmental, but governmental levies, marketing, and location costs that are associated with the production and distribution of the final product. If we look at the components that make up a gallon of gasoline, we can see that the cost of crude oil is 50 percent, distribution and marketing is 10 percent, taxes are 19 percent, and refining is 21 percent. Next, we can see that the cost of terrorism and worldwide political instability has surely driven the cost of oil in an upward fashion. It however remains interesting that as our demand for foreign oil increases that we are funding countries, such as Saudi Arabia, Iran, and Venezuela, who are not only awash in terrorism, but are gaining more anti-American sentiment. Thus, if we look further at this issue, we can see that as we spend enormous amounts of money fighting terrorism and anti-Americanism, we are in the end funding the root of the problem. Translated into dollars, implications of a potential terrorist attack have increased the price per barrel by almost $15. Although the aforementioned reasons are some of the major factors, there are many more influencers on the price of oil. Seasonality, which causes cyclicality in the price of gas, is determined by what time of year it is. Increasing travel during the summer months increases demand by nearly 5 percent, thus causing an increase in price, which is transferred to the consumer. Environmental regulations also influence the price of gasoline. A state that has statutes less forgiving than federal guidelines is California, where refiners are subject to restrictions on reformulation, storage, and other miscellaneous rules which they must follow to comply with standards established by the state. These increasing rules and regulations are felt by the consumer, as the refiner passes these costs to the consumer at the pump. Lastly, in terms of affect of increasing oil prices, severe or deteriorating weather conditions can drastically influence the price. As Hurricane Katrina has ravaged the Gulf Coast, it has damaged the heart of oil refineries, which use the Gulf Coast as a centralization point in storage, production, and distribution of oil supplies. Gasoline prices continue to increase and are currently at record levels. Hurricane Katrina ravaged New Orleans and parts of Mississippi. New Orleans and the Gulf Coast area have refineries that account for ten percent of the refining of the United States. A loss of ten percent production translated to an increase of fifty cents a gallon or more at the pump. To further complicate the refinery production problem, hurricane Rita is on a course for Galveston and other areas of Texas which account for thirty five percent of US oil refining production. This could prove to be a major problem for the United States with another major increase in gasoline prices. When the gas prices continue to shift the question becomes “What will this do to consumer spending?” Ultimately, a significant change in consumer spending will determine what happens to the economy. Will consumer spending go down simply because it costs more to commute to work or leave town to visit relatives. The answer is no. People will still continue to drive where they need to go, and they will continue to take trips to see family and friends. The frequency of these trips may decrease, but not at a level that would affect the economy. The large affect stems from the cost of manufacturing and transporting goods. Businesses will pay more to produce items, which will ultimately be passed to the consumer. When prices escalate to a level that consumers are unwilling to pay they will spend their money elsewhere. This is a direct reflection of the law of demand. As the price of an item goes up, the quantity demanded will decrease. 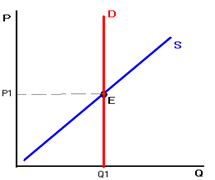 This inverse relationship defined by the law of demand will begin to have an impact on the economy over time. In the past, high energy costs have been a key predictor of economic slowdowns. So far we have not seen a recession begin to occur. The Federal Reserve chairman has kept the economy in check by increasing interest rates eleven consecutive times in a row. This has been done in an effort to control the very inflated housing market. The Fed may have to continue with this trend to combat inflation due to the rise in energy costs. Gas prices are only a part of the problem that Americans are facing. The winter months are approaching, which will begin to show an even larger problem. Gasoline only accounts for about fifty percent of the oil use in the United States. Energy prices will become a shocking reality when heating bills begin to surface this winter. Natural gas, home heating oil, and electricity costs all continue to rise. So, why aren’t citizens rushing to the stores to purchase thicker jackets, blankets, and sweaters? Wouldn’t this help alleviate the higher energy prices this winter? The problem is that the prices for all of these goods are going to continue to increase as well. Oil prices will be felt in the trucking and shipping industry, which in turn will be passed along to the consumer. Consumers are crazy to think that by not buying gas on a specific day will cause oil companies to decrease their prices. The only thing that will bring the price down is to decrease the quantity demanded. How can we as consumers do this? We are headed in the right direction by companies producing more energy efficient products. Everything from refrigerators to hot water heaters to automobiles are more energy efficient than they were thirty years ago. What else can be done to reduce the quantity demanded? In cities such as New York and Chicago, the transit system is sufficient to support a majority of those that work in the city. The transit system in San Diego is not as efficient nor does it have the capacity to transport a majority of those that work. However, parking the SUV during the week, arranging to carpool, and walking or biking for those that are close enough could certainly have a large enough impact to affect the quantity of gasoline demanded. Additionally, homeowners can take measures to make their homes more energy efficient for the winter by caulking windows and doors, or possibly by turning off the heater to their pool. These may seem like insignificant ideas, but if a large percentage of the population were to take these steps in conserving energy it would certainly be felt by the oil companies. In an article by Congresswoman Deborah Pryce, she states that the US Department of Commerce estimates that America is losing nearly 2 million jobs annually due to oil prices. Even as our economy grows, the increased demand for energy and our dependence on foreign sources of oil will keep us from meeting our full economic potential. Alan Greenspan states that our low energy supplies are the biggest threat to an otherwise burgeoning economy. The simple answer then may be to open up Alaska for oil drilling. We must find ways to be more efficient when drilling in our oil fields. Innovation is the key. We need to find a way to use existing energy supplies more efficiently and explore new alternatives through extensive research and development. If conservation and innovation are promoted through incentives, we will undoubtedly create new technologies to provide energy in the future. Additionally, oil rigs that were shut down when prices were thirty five dollars per barrel may now operate out of the red at sixty five dollars a barrel. We must operate at maximum capacity and have less dependence on other countries for our oil supply. If we are able to do this, our economy will continue to prosper throughout the years to come. Hirschey, M. Managerial Economics. Florence, KY: Thomson South-Western. Zakria, F. How to Escape The Oil Trap. Newsweek.